As James from MOAB T&F series would say, "Shut my mouth!" Those models are absolutely FANTASTIC!!!!!! The detail is perfect. When I first saw them I thought they were the actual TV models stripped from their paint. You could probably pass them for the real models. Like Santa Fe Bluff said since the models are larger, much larger then the HO, you can add more details. I can't wait to see what Thomas and Percy will look like. I'm hoping they'll have extremely accurate faces, and I'm sure they will. I know they will definitely have better detail than the HO. My God I'm gonna pee my pants I'm so excited!!! It's a good thing my mom and I are making a garden railroad this year (well we're not entirely sure yet). Again FANTASTIC models!!!!!!! 1. You sound way too excited, which makes you look like a watchamacallitcuzicantsayit. 2. You can't leave Bachmann Large Scale track outdoors. 3. You look like a watchamacallitcuzicantsayit. Wow this is the first time i looked down here and why are you calling him some kind of........ ...... ....i don't really know but he can be excited! Man, those models are awsome lookin'. Too bad I can't get them now . Ah well, If tose are still around when I make the switch to say, G guage, They are so being bought! i think the g scale models look great keep up the good work the bachmann ! Please tell me one of the extras supplied with the locomotive is going to be a proper English smoke box door (and some other details) that can be fitted instead of the face. I am a fan of the real Thomas not the modern #### and hope it will be the Proper Rev Awdry locomotive which means no face not the unreal TV one. I hate being Captain Obvious, but they had faces in the books too. Also, it's going to be the TV style. That's a GIVEN. As James from MOAB T&F series would say, "Shut my mouth!" Those models are absolutely FANTASTIC!!!!!! The detail is perfect. When I first saw them I thuoght they were the actual TV models stripped from their paint. You could probably pass them for the real models. Like Santa Fe Bluff said since the models are larger, much larger then the HO, you can add more details. I can't wait to see what Thomas and Percy will look like. I'm hoping they'll have extremely accurate faces, and I'm sure they will. I know they will deffinately have better detail than the HO. My God I'm gonna pee my pants I'm so excited!!! It's a good thing my mom and I are making a garden railroad this year (well we're not entirely sure yet). Again FANTASTIC models!!!!!!! You can run it, but I assume you cannot leave it out overnight. 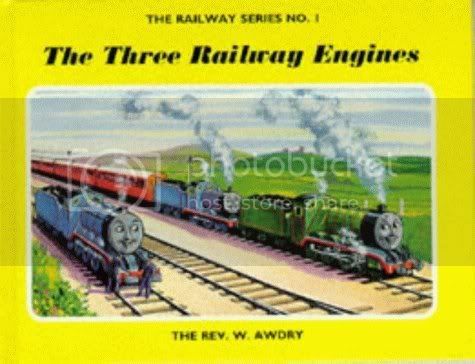 I hate to say this but the 1934 or was it 38 stories which I had copies of, did not have faces they where proper locomotive as are all the Thomas characters. in fact it was these that got me interested in model trains in the first place. The faces have been there since the dawn of their time. Maybe he was talking about Rev. telling them to his son. Which he was just telling those stories to his son, so at the time wasn't even a "true" series. 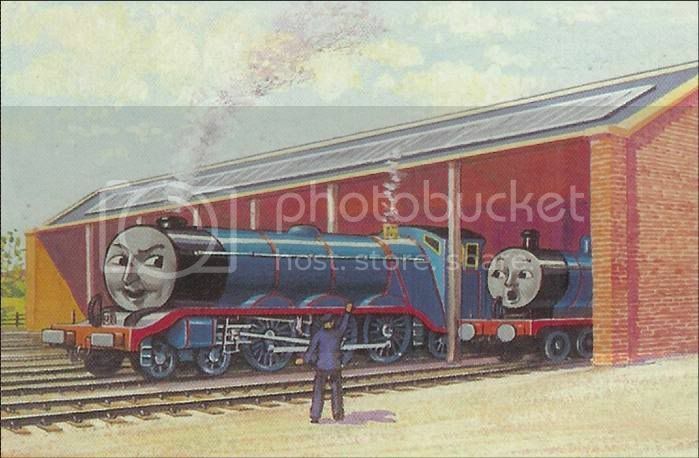 Awdry also did small sketches before the illustrations for the book was made, and even then the engines had faces. I wonder why the books I had never had the faces?? Do you have the books or remember what the titles were? Could you upload some pics? Visit the Thomas and Friends Wikia! 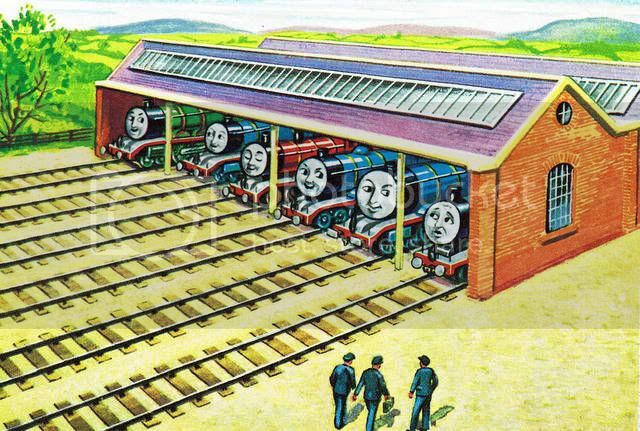 True, Awdry's models did not have faces, but they weren't 100% accurate. His original Annie, Clarabel and Thomas were HO scale, and his model of Gordon (A Gresley A1) was made from a Tri-Ang/Rovex Princess. The models Awdry had did give the names to at least one locomotive in the books.